Civilization: Beyond Earth promised an enormous gameplay experience filled with revolutionary design. 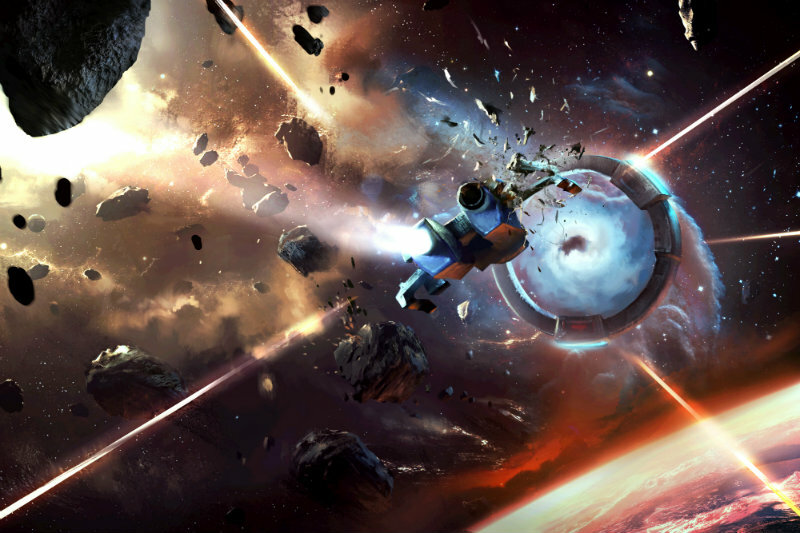 Starships had a much less grandiose promise – you get to embrace your inner space Admiral as you command your fleet of starships through exploration and expansion throughout the galaxy. Unfortunately, it isn’t quite a universal success. 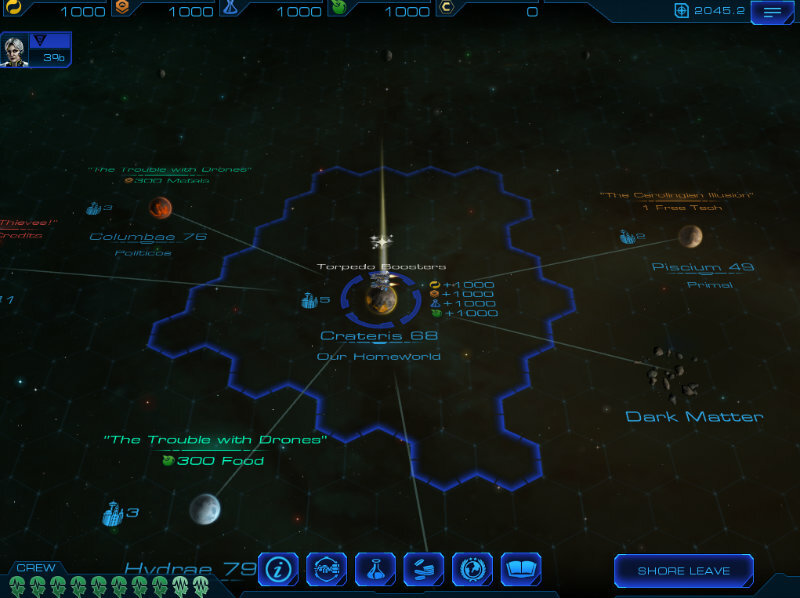 Starships builds upon the ideas in Civilization: Beyond Earth. 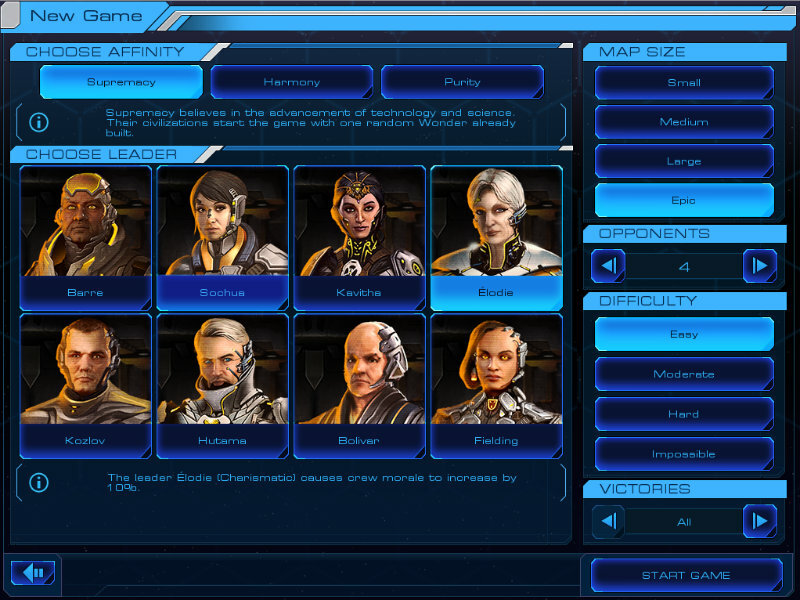 Beginning on your home world, you must select which of the Beyond Earth leaders you will be playing as in order to determine your perk. These range from having an extra city at the start of the game, to beginning with more ships or requiring fewer materials to repair your damaged fleet. 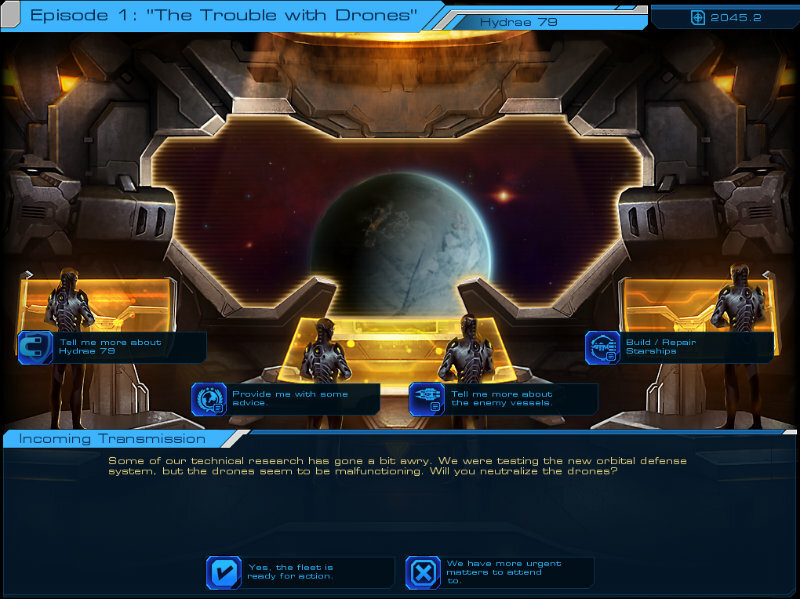 While these are loosely linked to the personalities we were introduced to in Beyond Earth, Firaxis continues its trend of using futuristic leaders with little to no personality. You must also select your affinity at the start of the game. While this can also have an impact on the game, all the leaders take on the same affinity for the game, so it doesn’t really differentiate your abilities or experience. 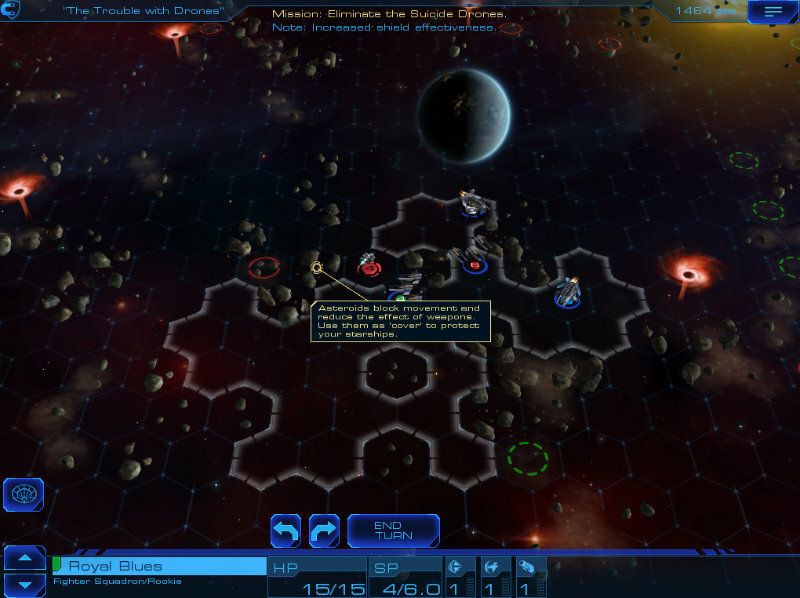 Players can also choose the size of map and difficulty. The interface for this and all other screens feels incredibly retro. The designs themselves are laid out well enough and it may feel nostalgic for some who miss the days when games looked like this. However, for a modern game, it ends up feeling a bit unpolished. In the future, commanding a star fleet, I’d like to think the UI will look a bit nicer. The object of the game is to explore, help each planet with its problems (which usually means blowing up a bunch of other star ships), and get them to like you enough to join your federation. Once your federation comprises 50% of the galaxy or more, you win. It’s much like taking over the world with your civilization, only you conquer the cities/planets instead of building them. Of course you will need resources to build your ships, improve the planets with cities, build upgrades and wonders or buy extra influence. As you get planets under your control, they will give you their resources. These are collected whenever you end your overall turn which is disguised as giving your crew shore leave. Players will generally want to do this on planets where they’re still seeking influence; shore leave apparently sends your crew campaigning on the planet, making them like your federation more. There are still options for diplomacy and research although these are nowhere near as deep or nuanced as a traditional Civilization game. Upon encountering another civilization, you can look at their fleet and find out about recent activities. You can also enter into an alliance with the other civilization, although I never really saw any point to using that feature. You can’t do much more than that and interaction is rather limited. In fact, narrative as a whole is rather lacking throughout the game. Research is similarly stripped down. 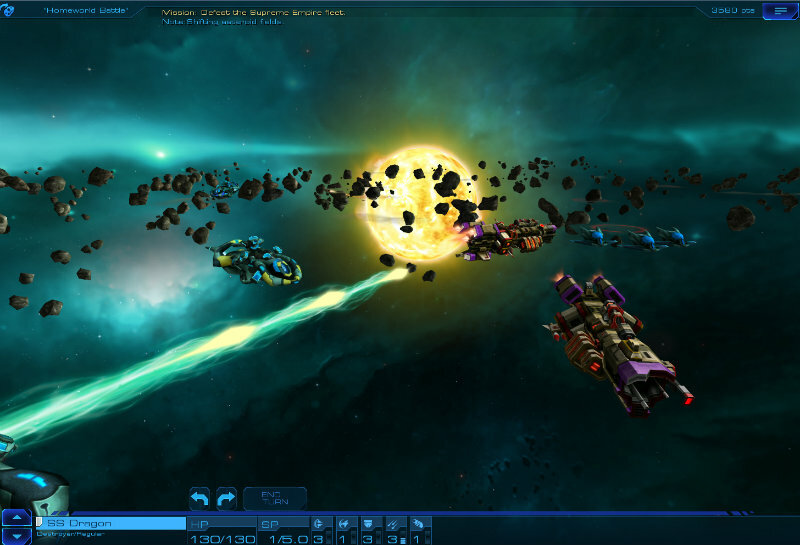 Players can choose to research the various ship upgrades. However, this never unlocks new ship customization options. Instead, extra improvements such as letting fighter jets act in the turn they’re launched or overcoming distance handicaps for laser cannons are all achieved by building wonders on planets. While it makes building wonders worthwhile, the research system ends up feeling linear and boring. It seems as though the actual exploration is second to the space battles, which is where the game shines. Land on a planet and you may be asked to help destroy a fleet of pirate ships, or perhaps you will need to stop a colonizing ship from reaching its destination, or perhaps you’ll need to sneak a bunch of survivors through a warp gate using only your flagship. Each of these missions requires specific strategies as you maneuver through asteroids and fire lasers and torpedoes at your opponent. It’s fun and strategic with some rather pretty visuals. Before you start the battles, your advisor will give you a percentage change of success. I’m not sure if these are based on people playing with zero strategic thinking, but I found these indications to be way off the mark. Even matches where I had a 30% chance of success could feel like a cakewalk if my approach was on point. Obviously higher difficulties require better strategies, but I still found the calculations to be way off the mark. Games run rather quick and you can generally play a match from start to finish in around two to three hours. This makes it an excellent addition to the Civ lineup as those who don’t always have time for a sprawling strategy game can still scratch the itch in a shorter time period. For this reason, I think the game will be much better suited to its iOS release. On PC it ends up feeling rather thin, whereas it will be a beefy iPad title. For $15 it offers some decent value, although you definitely won’t get the hours of replay value out of it as you would from a “normal” Civilization game.